By now everyone should know that Montagu was chosen as the Western Cape Town of the Year - which puts us directly in line for the National (including Namibia) Town of the year. Thanks to great promotion and many Social Media postings and most importantly VOTES - we got to this privileged position. 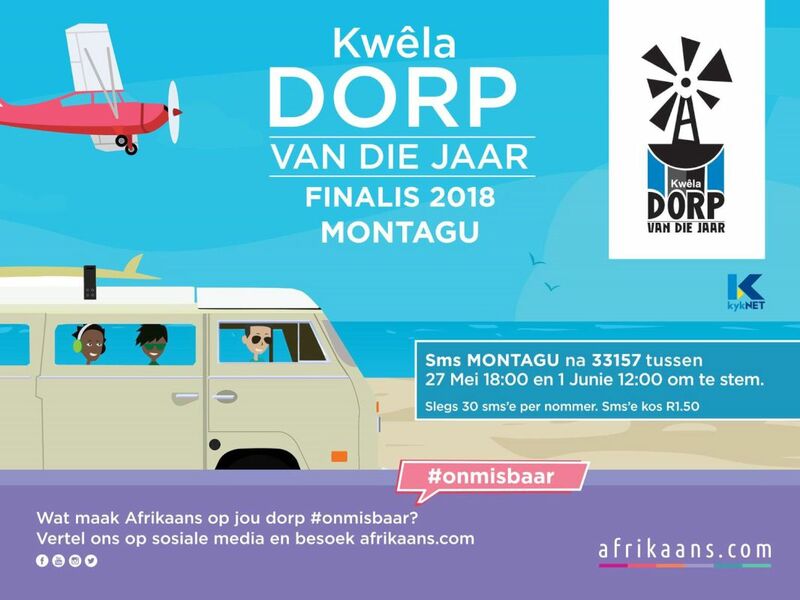 The secret was already out when the recognizable KIA and Afrikaans.com branding was very visible all over town in April. On 10 and 11 April the Kwela team already spent many hours in Magical Montagu to film as many as possible of the beautiful places, people and things to do for a special insert that announced Montagu as the Winning Finalist of the Western Cape in the Kwela Town of the Year Competition. Now that all 9 finalist towns have been announced - the voting lines are open (from 27 May until 1 June, 12:00 midday). The winning town will be announced on 17 June 2018 on Kwela, KykNet, at 18:00. The winning town walks away with one -million- rand TV airtime on KykNet for a year. It is only VOTES that count at this point- so please do not hesitate to vote immediately - Just sms to 33157 - MONTAGU!! You can send 30 sms's from a cell number. Homebrew Films, the producers of Kwela, will produce a 45 second advert about the town that will be flighted for the year. There will also be a huge KIA Dorp van die Jaar Makiti (party, Festival, jollification) in the winning town and everyone is invited. Music, food, fun and loads of that winning town spirit. Also, this Makiti will be filmed and flighted at a later stage on KykNet - publicity that is indeed invaluable to our lovely town.